Second generation speakers with wide-dispersion waveguide, woven aramid-fibre woofer, thick MDF cabinets creating a genuine 3D atmosphere that is ready for Dolby Atmos. 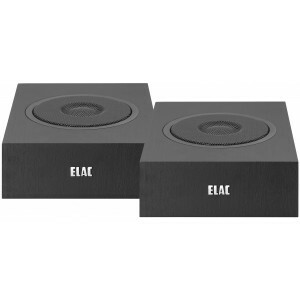 ELAC Debut A4.2 Atmos Speakers add a whole new dimension in entertainment. Dolby Atmos technology expands the sonic landscape, creating a true 3-D space that you’ve got to hear to believe. With Dolby Atmos-enabled AV receivers and processors, simply add the Debut A4.2 to the top of your bookshelf or floorstanding speakers to achieve dimensionality that puts you in the middle of the music and the action. Thick MDF cabinets with a luxurious black ash vinyl finish are larger, and internally braced for greater stiffness and strength, greatly reducing cabinet vibrations which cause unwanted coloration. On the Bookshelf and Center Channel, moving the bass port to the front of the cabinet means placement against walls or in bookshelves won’t compromise performance. Recognizing that in a multi-channel system the majority of sound comes through the center speaker, we have optimized sensitivity and impedance to minimize the power requirement from the AV receiver, maximising dynamic impact from lower cost receivers.